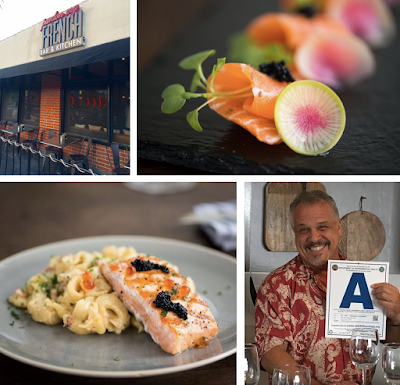 After less than a year in business, Fishmonger's Market & Seafood Bar closed its installation within the now-defunct 57 Degrees Bar & Event Warehouse in San Diego's Mission Hills/Middletown area last month, but its former Top Chef contestant owner has already found a new location, taking over the space previously occupided by Pardon My French Bistro in Hillcrest for a 2019 reopening. Founded by San Diego-born chef Frank "Frankie the Bull" Terzoli, who was once a contestant on Season 2 of Bravo's hit Top Chef culinary competition and won an episode of Food Network's Cutthroat Kitchen, Fishmonger's Market & Seafood Bar opened in October 2017 within 57 Degrees in Middletown, taking up 5,000 of the 16,500 square-foot space. The remote location proved to be too much to maintain, so Terzoli closed his restaurant right before the event space and wine bar shuttered for good. 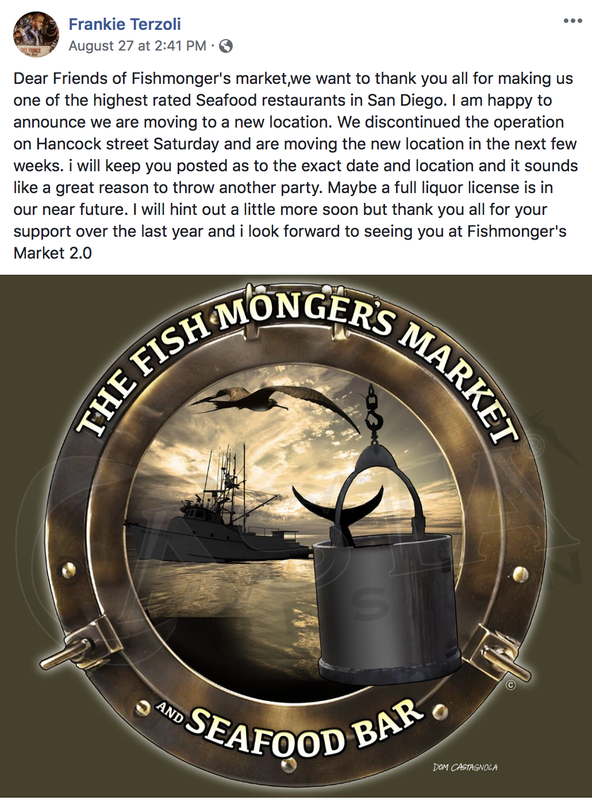 Fishmonger's will soon move into the location at 3797 Park Boulevard on the border of Hillcrest/North Park that was left dormant by this summer's closure of Pardon My French Bar & Kitchen. After a remodel, the restaurant will reopen, possibly with a new name, offering ample outdoor patio dining and a crudo bar. The sea-focused menu will include items like oysters, poke, seafood towers, clambakes, seafood boils, smoked fish, cioppino, seafood sandwiches, and larger entrees. There will also be an onsite fish case to purchase fresh seafood and other ingredients. Fishmonger's 2.0 will also have a full bar with cocktails, beer and wine. Terzoli started cooking at his uncle’s restaurant (the Venetian in Point Loma) as a teenager and has since cooked his way around the world at over 50 restaurants in more than 15 countries. He has opened several restaurants in San Diego over the years and has been an avid fisherman and sea captain since his 20s. During the past 4 years, Terzoli has worked to create software to assist in sustainably sourcing seafood, in addition to his culinary consulting business. Fishmonger's Market & Seafood Bar is anticipated to open by early 2019.